Print Wikipedia, an effort to envision all of English-language Wikipedia as an old-fashioned dead-tree reference set, reached its conclusion just before 10 p.m. on Sunday when a handful of people gathered at a Lower East Side art gallery to watch the last of 7,600 volumes upload to the print-on-demand Web site Lulu.com — exactly 24 days, 3 hours and 18 minutes after the process began. The project, which was showcased at Denny Gallery in an exhibition titled “From Aaaaa! to ZZZap!,” does not actually involve printing all 7,600 volumes, but envisioning what a printed version would look like, and how big it would be. At the gallery, that meant combining a minimalist-chic aesthetic with high-nerd performance art. 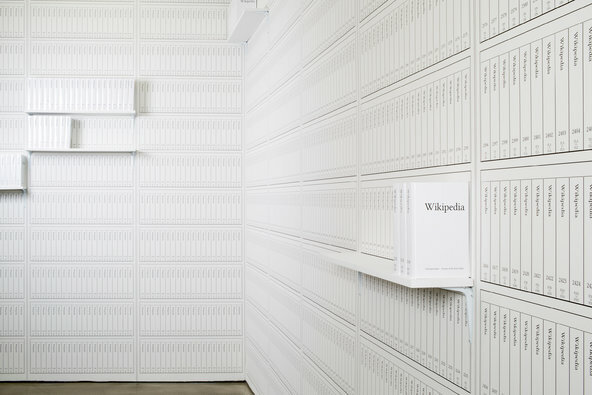 Most of the gallery’s walls were covered with black-and-white wallpaper showing the spines of the first 1,980 volumes (each of which runs to about 700 pages), supplemented by 106 physical volumes on white shelves. The Print Wikipedia page at Lulu.com was projected on a lone blank wall, allowing visitors to track the upload in progress. That upload ran into a few glitches, Mr. Mandiberg said, prompting some rewriting of computer code on the fly and pushing the show’s closing back by about a week. It also revealed some surprises about Wikipedia’s content. Who knew, for example, that there were more than 600 volumes of entries containing only lists, like the one running from “List of Power Rangers Lost Galaxy episodes” to “List of pre-modern great powers”? So far, no buyer has emerged for the full 7,600-volume, 5.4-million-page set, which is priced at $500,000. Several dozen individual volumes were sold through the gallery, with more ordered online through Lulu.com, where they remain available.